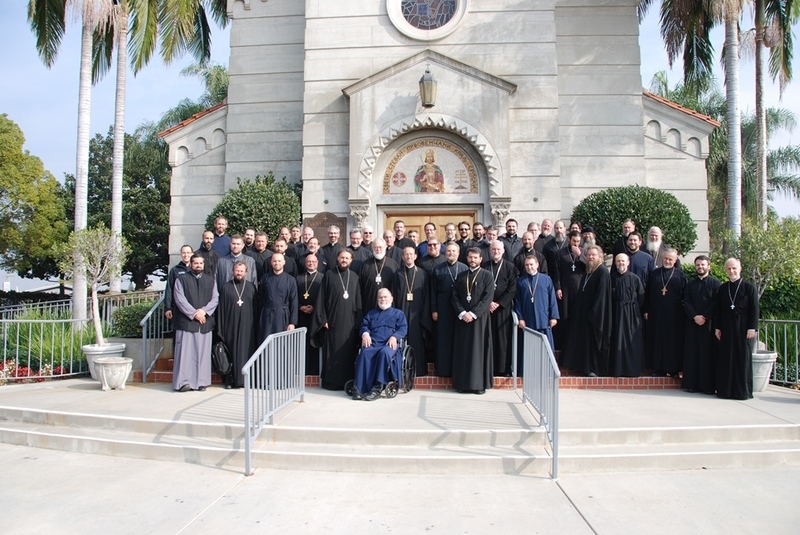 Saint Steven's Serbian Orthodox Cathedral of the Western American Diocese was honored to host the Orthodox Christian bishops and priests from the West Coast for the annual Pan-Orthodox Clergy Conference held November 16-17, 2016. As 2016 was the year of the historic Great and Holy Council of the Orthodox Church which was held on the island of Crete in June, the bishops, priests and deacons gathered to reflect on the importance of the conciliar nature of the Church and the meaningful contributions of the Holy Councils and their implications in the life of the Church. It was a great blessing for us to host this important gathering which brought the Orthodox clergy on the West Coast together in brotherly love and energized them in their ministry of service to God and His faithful people entrusted to their pastoral care. The first day of this year's Retreat focused on the Church of the Council: The Implication of Synodality in the Life of the Church. Guest Speakers included His Grace Bishop Maxim of Western America and Professor of Patrictics at the University of Belgrade; Fr. Nathanael Simeonidis, Director of the Office of Iner-Orthodox Ecumenical and Interfaith Relations, Greek Orthodox Archdiocese of America; Fr. Cyril Hovorun, Senior Lecutrer at Sankt Ignatios Academy/Stockholm; and the Moderator for each presentation was Deacon Nicholas Denysenko, Associate Professor of Theological Studies and Director of Huffington Ecumenical Institute, Los Angeles. On Wednesday evening the hierarchs and clergy enjoyed a beautiful musical performance by the Pan-Orthodox Young Adult Choir of Greater Los Angeles (POJAC), led byJohnathan Braun. Arrangements includes Christmas Megalynarion,, All of Creation Rejoices, God is With Us, Awed By The Beauty, and Praise the Name of the Lord. On Thursday, the Feast Day of St. Gregory of Neo-Caesarea, the Hierarchical Divine Liturgy followed by a Memorial for Clergy and Hierarchs. The Retreat conluded with a Brunch and closing remarks by the Hierarchs. The ladies of the Diocesan Kolo Srpkih Sestara of the Western American. Diocese, led by Laura Burge, the SKSS President, lovingly prepared all of the meals for the two-day event, extending a warm welcome and ensuring a pleasant and productive stay for all of the hierarchs and clergy who participated in this annual Pan-Orthodox Clergy Conference.